Personally, yeah, we can hear you guys, and that’s good. We have the greatest fans, just so you guys know. But one thing that I am going to ask, and I know that a lot of guys get irritated with this so don’t take it the wrong way, but the wave needs to go. When I was in the bullpen in the playoffs against the Rays, we had a close game and we were ahead and fans were too busy doing the wave instead of getting behind us. Do it when we’re up by a lot, that’s all I ask. The wave is great, just do it at the right time, that’s all. Please don’t take any offense to it. 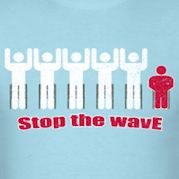 We like the wave – just do it at the right time. Philly fans don’t need a teleprompter to tell them to cheer.